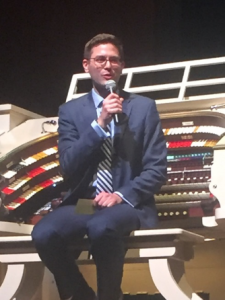 Mark Herman charmed the audience on June 10 in his third appearance as the Dickinson Theatre Organ Society (DTOS) continued in its 47th concert season. Before the show, I had the opportunity to speak with Mark and ask him to give me a feel for what to expect in his selections for the evening. 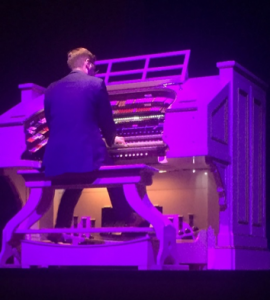 He said he was going to be “all over the place” and “playing his favorites.” While in town, Mark said that he was able to do some “organ sightseeing” – and playing! He found a few of the greats in the area, such as the Wanamaker Organ in Philly and the Boardwalk Hall pipe organ in Atlantic City. Mark opened his show with Edgar Sampson’s 1934 big band standard Stompin’ at the Savoy, followed by Poodle in the Park. He then featured The Boy Next Door from the 1944 musical Meet Me in St. Louis. According to Mark, every good theatre organ concert features a few medleys, so he offered a Cole Porter medley, which included Just One of Those Things, My Heart Belongs to Daddy, Let’s Do It, I Concentrate on You, and Anything Goes. He complimented the Mighty Kimball for being able to do just about anything and he was able to demonstrate that throughout the medley, complete with sound effects. Next up was Irving Berlin’s 1927 Russian Lullaby, followed by the great 1929 Gene Austin Wedding Bells are Breaking Up That Old Gang of Mine. He ended the first set with a medley by Noël Coward, who is a counterpart to Cole Porter, which included A Room with a View, I’ll Follow My Secret Heart, If Love Were All, I’ll See You Again, Poor Little Rich Girl, and I Like America. Mark had some big news to share with the audience – he is getting married in July, to which the audience responded with a great applause. Who does a renowned theatre organist have perform at his wedding? None other than Simon Gledhill, Richard Hills, and David Gray! Wouldn’t we all love an invitation to that wedding!! After intermission, we were treated with a piece that highlighted the full organ sounds as well as the reeds: Fanfare for La Peri (1912) by Paul Dukas, also known for his original composition of the Sorcerer’s Apprentice. Mark suggested that he was born in the wrong era – because he truly loves performing music from the 20’s and 30’s. New music to him is anything written after 1933! So this next piece was more modern, although styled like the 1920’s – one that he had written himself, Jarvis — named after his dog. 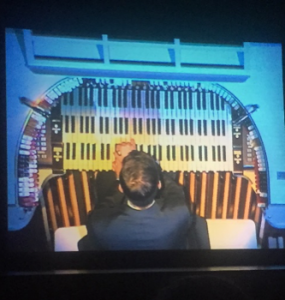 Mark ended his show with a Rogers and Hammerstein medley featuring selections from The King and I, including Whistle a Happy Tune, March of the Siamese Children, Hello Young Lover, Shall We Dance, I Have Dreamed, Getting to Know You, and a song to signify DTOS’ Kimball Organ — Something Wonderful. As an encore, Mark offered Artie Shaw’s 1938 Back Bay Shuffle. At the on-stage reception immediately following the concert, members of the audience had the opportunity to spend some time with Mark, even get an autograph. Several guests told me that they loved how Mark “put his heart into his music” and could “feel the passion” in his playing. He is, indeed, a talented musician!